Since hitting the halfway point of pregnancy, a smoothie before “real breakfast” has turned out to be the easiest way (for me) to ensure I’m getting the extra 300 nutrient-dense calories I need per day to nourish the Ravenous Fetus. Not that I really count the calories in my pre-breakfast smoothies, but I’m guessing they work out to be about 300 calories and they are certainly filled with good things like whole fruits (and vegetables sometimes) and Omega-3 and 6, calcium, probiotics, complex carbs and protein if I decide to add some whey protein powder, which I often do. 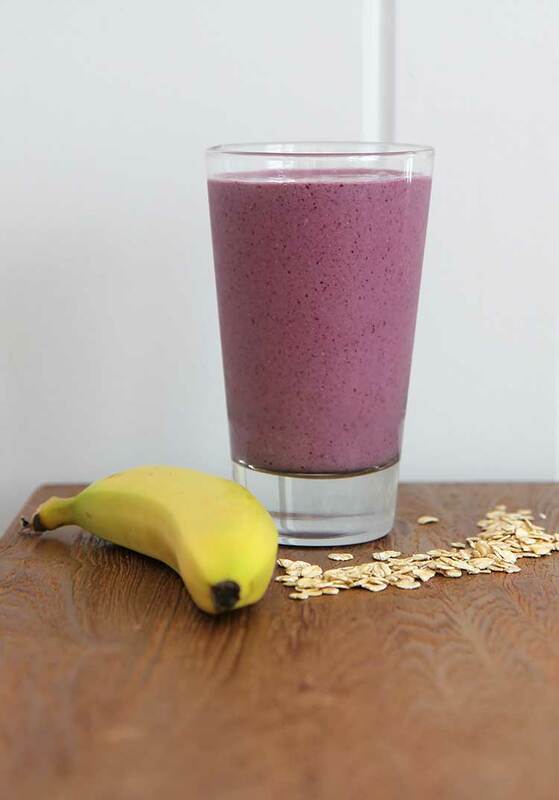 This Berry Banana Oat smoothie is in regular rotation. I always keep bananas, peeled and chunked, in the freezer along with frozen berries. I usually buy the berries already frozen (much cheaper than fresh berries) but if I see organic strawberries on sale, I’ll get some extra, rinse then and cut them in half (leaving the hulls on) and freeze them. I figure: the hulls must add some kind of nutritional value; I don’t notice them at all once pureed; and it’s easier than bothering to hull them. The rolled oats add that good-for-you insoluble fiber that keeps digestive things running smoothie (PunClub President, at your service). Put the milk into the blender first, then all other ingredients. You can assemble the ingredients in the blender jar the night before, store in the fridge, then blend in the morning for an even quicker smoothie. Add a couple ice cubes if you do it this way to make sure it’s cold and thick. I’ve got many more smoothie recipes here! Looks delicious, Hilah…..Thanks for posting!!! Looks great, I’ll give it a try. I ran across your show when searching for taboule recipes the other day and love it. From one Austin resident to another keep up the good work! Even though I’m not pregnant (and I am not getting pregnant any sooner since, well, I’m a guy), I’ve been on this “healthy” kick lately and, I have to say, smoothies are THE BEST WAY of getting nutrients and vegetables easily and yummily; and adding oats makes them thicker and denser and ALSO! RICH IN FIBER! I had this banana spinach smoothie today. SPINACH ON A SMOOTHIE! Getting all Jack LaLaney over here. Cool recipe as always Hilah! Greetings from Chile. I started out this morning researching exactly what makes up a “complete” protein (I’m still keeping rice on the forbidden food list). After reading up on hemp seeds and chia seeds, I’m eager to try them out. Especially chia seeds. Which is why I’m here…even though I’m not much of a smoothie person :). Have you experimented with chia seeds much? I’ve seen them used as simply as sprinkling them on cauliflower before roasting. But I’ve also read that they get really gelatinous when liquid is added to them and that they make a good substitute for eggs in baked goods and that you can make a no-cook pudding by mixing them with coconut milk. I’m curious as to how they would work as a binder in bean cakes. I’ve only put them into smoothies. I have seen several no-cook chia pudding recipes, though, and it seems like it would be good. Fun texture and flavored with whatever you want. They don’t have much flavor on their own. When they are soaked in water, they release a kind of jelly that does seem like it would work in baked goods. But your comment reminded me of this eggless flax noodles recipe I saw recently. Yeah, as a omnivore, I was never really concerned with complete proteins and I vaguely remember it being declared a non-issue in that one is reasonably assured of getting the 9 essential proteins that human bodies don’t create via whatever we eat in any given day. The real issue is that I’m finally going to be getting a dining room table in the next couple of months and most of my dinner party guests will be vegetarians who each seem to have differing approaches to getting protein. One eats eggs, another eats cheese, etc. I decided I’d best just make vegan meals. “Complete protein” was the first term that came to mind when I decided to search for “veganizing” strategies. At some point, I started coming across lists of ingredients like quinoa, hemp seeds and chia seeds that are high in protein and was very intrigued by chia’s properties. Ah, yes, that makes sense. Even if it’s not nutritionally necessary, protein complementing sure does make a world of difference in how satisfying or complete the meal seems while you’re eating it. I’ve got a bag of hemp seed hearts (hulled seeds, I guess) that I also throw into smoothies. It’s a huge bag from Costco and I really should come up with more things to do with them. They have a nice, buttery texture so I think they’d be good blended up in pesto or hummus or something like that. Hey! This recipe looks really good! I’m going to try it out today afternoon..
hello! the smoothie was so bomb! my boys and i enjoyed it very much!